Me and my friends went to Icebergs a couple of days ago. This is one of those I’ve-passed-by-this-place-a-lot-of-times-before-but-never/rarely-tried-it places—for me, at least. I think the number of times I’ve been here can be counted in one hand. From its name, you can assume it specializes in ice cream, which it does. The branch I always pass by, especially when I was a child, was the one in SM North EDSA. But the place it’s in is pretty obscure that me and my lola, whom I always go with to go grocery shopping there back then, don’t get to visit it. That, and my family has a history of diabetes. That doesn’t stop any of us from eating ice cream, though. Anyway, the branch we went to was the one in Trinoma. Similar to SM North’s Icebergs branch, this one is also in an obscure place, surrounded by apparel stores that you wouldn’t think there was a food place here. I also thought it was pretty funny that despite this being an ice cream store, the place features other foodstuffs, specifically Pinoy favorites such as sisig. Because I was hungry, I decided to try out one of their “all-time favorites”—their Golden Lechon Kawali (178 Php). The reason I got that was the rice, which I found interesting. 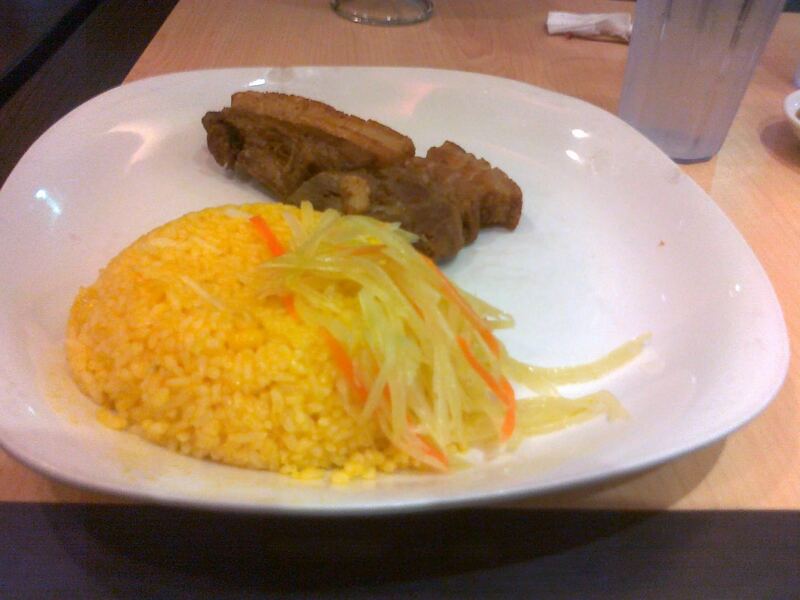 I upgraded the plain rice that comes with the meal to their Yellow Corn Rice for 32 Php. Because Icebergs is an ice cream store, I also got one of their desserts—their Caramel Flan con Hielo (118 Php)—after a very hard time deciding. My meal came first. Don’t let the picture fool you—there’s actually a lot of rice and a thick cut of meat. My friends were laughing at the fact that the pork was extremely oily on the side down, teasing that I would certainly die young. Nevertheless, I will admit that this is one great piece of pork. The fats toasted just right to retain its delicious flavor while still having enough juices keeping it from being dry. The atsara is a welcome addition to the plate as well, making for a great palate cleanser. Sadly, the rice, which was the reason I ordered this plate, wasn’t really that great. I expected a buttery flavor, but it just tasted a bit plain. The only difference, aside from the color, is the random bits of corn every now and then. On to dessert—the Caramel Flan con Hielo arrived in pretty generous serving. 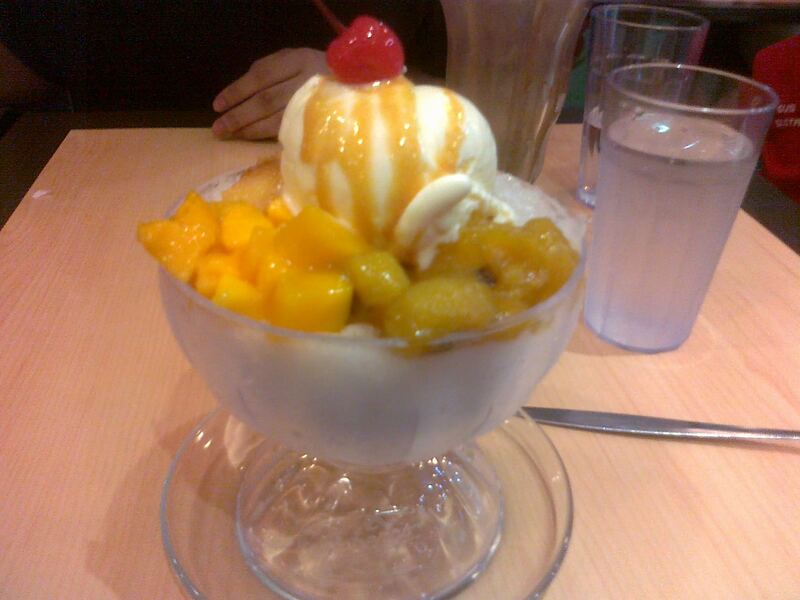 The scoop of vanilla ice cream is drizzled in caramel syrup, surrounded by the other ingredients: mangoes, saba, macapuno, and leche flan; all on a bed of ice. Because this is a con hielo, there’s also milk on the side. I didn’t really dig the idea of having con hielo with ice cream mixed in, so I consumed the ice cream before mixing in the milk. I’ll admit it was good ice cream, but I found nothing special there. The fruits I’ll also admit to being great, but, again, nothing special. All in all, a pretty good dessert, I guess. There was certainly nothing wrong with the food I had in Icebergs. The one thing bothers me is the price. I felt like I paid twice the value of my lechon kawali. Sure, you can argue that this is a dessert place, and other dessert places have similar prices. But I don’t like the prices on those stores either. I can get ice cream for less than a quarter of what I paid and still taste the same. Same goes for the other ingredients. If it costs four or five times more for them to prepare it in a way I could, I’d pass if I could. But I guess it’s okay to splurge here every once in a while. If you love ice cream or sweet stuff, you’re gonna have a hard time deciding what to get here. But I can guarantee that you’ll like it—just turn a blind eye on the price tag. Not recommended for: Ice cream haters. Smart nomnomnom tip: Don’t forget to wash it all down with water afterwards.